An old bowling ball can be converted into a decorative piece of patriotic garden art using flat craft marbles. 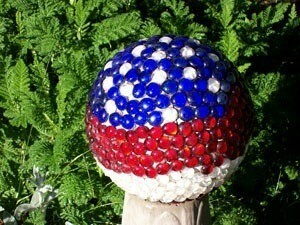 This is a guide about how to make a patriotic garden ball using a bowling ball. I love to recycle, especially when I am taking something that was used for one purpose and making it into something that can be used for a totally different purpose. Here I would like to share an idea that really uses something that most people have or can easily come by and that makes a beautiful decoration for your garden. The instructions are easy and it is not really messy; so it is even something that older children or teenagers might like to do. We are going to recycle a bowling ball into a garden ball that will catch the light and be a joy to look at. Now I made mine red, white, and blue in a free form flag sort of arrangement, but these can be made in any color you would like. I bought 3-4 bags and had plenty left over. These can be bought in the floral section of Walmart. They are used in the bottom of vases. This comes in a tube and can be found at any home center or hardware store. First, find yourself a bowling ball. You may have one hanging around or you can buy them at most major thrift stores for around a dollar, but if you are a scrounger like me, you can try your local bowling alley and see if they have any they are getting rid of. They don't need to be beautiful, the more scuffed up they are, the better for you because they will probably give you all the damaged balls you want. You will want to clean your ball really good with window cleaner and a towel. Now take your ball outside and spray paint it the color that you have picked out. Use your coffee can, full of sand or rocks, as a stand. Let ball dry completely. Now here is the fun part. Put your bowling ball back on the can. Cut open your tube of silicone (which in my family we call glue because, if we are gluing something that needs to be waterproof, we use this) and squirt some on a piece of tinfoil. With your knife, spread a small amount on the back of your flat marble and press into place on your bowling ball. Hold it there for a couple of seconds to get it to stay put. Cover half of your bowling ball and let it dry until the next evening. Turn your ball over on to the covered side and cover the rest. Unless you have gotten a ball with huge finger holes you can usually cover them with just one marble. But I usually tightly pack the finger holes with paper or Walmart bags, keeping it flush with the ball and then cover with marbles. I always leave the thumb hole exposed so that I can display them on a piece of rebar in my yard but if you have an old cement stand from a bird bath that has gotten broken, it is a great way to recycle that too. You can make stripes on your balls or make a pattern like my flag or work any kind of pattern that you like. A very pretty patriotic idea - thanks for sharing it with us! God bless you! Cool Debra, thanks for sharing this. I bet families with military members would especially like the patriot theme. I have 7 military in my family so, I really am proud of them for their sacrifices. May be good gifts for them. Or putting your address number on them or your last name. As you can see I truly love your idea. Thanks again. THANKS FOR THE WONDERFUL IDEA..WE ARE GOING ON VACATION AND WE ARE CAMPERS; TO OCCUPY OUR TIME, I AM TAKING MY OLD BOWLING BALL WHICH IS PINK AND GRAY AND MAKING ONE OF THESE BALLS! WE ARE LOOKING FORWARD TO IT. I WILL POST A PICTURE WHEN WE COMPLETE IT. WE JUST RETURNED FROM A CAMPING VACATION AND WE MADE A PATRIOTIC GARDEN BALL FOR OUR YARD; WE PAINTED THE BOWLING BOWL WHITE AND USED BLUE FLAT MARBLES. 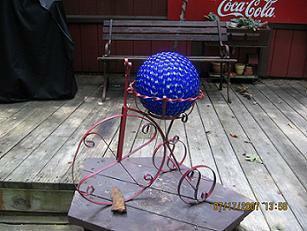 I PLACED IT IN A SMALL BICYCLE PLANTER STAND THAT IS PAINTED RED. IT IS REALLY PRETTY ON MY DECK AND THE SUN REFLECTS OFF THE BLUE MARBLES AND IT IS SPECTACULAR.